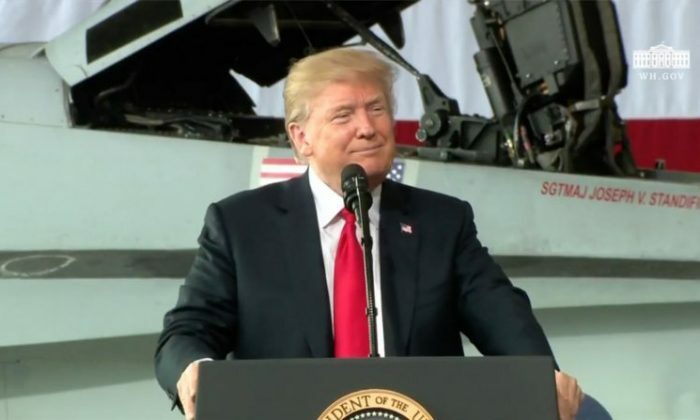 President Donald Trump signed an executive order on June 18 that directed the Department of Defense to create a Space Force as the sixth branch of the U.S. armed services. Soon after, Russia and China stepped forward to criticize the move—and for those who understand the background of the issue, the countries’ statements were both hypocritical and misleading. The head of Russia’s Federation Council’s Defense and Security Committee, Viktor Bondarev, said on June 19, according to Russia Today that the “militarization of space is a way to disaster.” Russia is ready to “strongly retaliate” if the United States violates the outer space treaty by putting weapons of mass destruction in orbit, Bondarev said. “In particular, we oppose turning outer space into a battlefield,” Geng said. Geng ironically gave his statements the same day that cybersecurity company Symantec uncovered a Chinese espionage campaign has been breaching and infecting computers that monitor and control satellites. Technologies such as this would fall under the Chinese regime’s secretive “Assassin’s Mace” program designed to rapidly win a war through surprise attack and by disabling technologies crucial to the U.S. military such as satellites. The CCP has also long demonstrated its development of and willingness to use space weapons, going back to 2007, when it destroyed a Chinese weather satellite. Fisher noted that the individual who commanded the Chinese space launch facility behind the weapon test has since become the first commander of the Chinese equivalent of the Space Force. Recent media reports suggest something bigger may also be at play, to which Trump’s executive order may be related. The Washington Free Beacon reported on May 25 that it was able to view new legislation showing that Congress ordered the Pentagon “to immediately begin construction of space-based missile interceptors,” in response to threats from several countries, including North Korea, China, and Iran. The increased threats were highlighted by Rebeccah Heinrichs, a national security and missile defense expert at the Hudson Institute, in a recent essay. “Adversaries are exploiting U.S. vulnerabilities in space in a variety of ways, but in particular, adversaries are advancing in the area of missile development including direct-ascent anti-satellites,” Heinrichs writes. “To close the gaping holes in U.S. defensive capabilities the United States must fully utilize space across domains to protect what the United States values most: the U.S. homeland, deployed forces, allies, and assets located in space.